You know I've talked a lot about my two Aunts in Victoria. Auntie May is the one who fell out of a cherry tree 4 years ago, and never really recovered - her spine is deteriorating. When you're 79, it's hard for bones to heal they way they used to. Well, now Auntie Kay is sick - she's got bowel cancer. She's been having symptoms for a year at least, but her doctor never ordered any colonoscopy until just a few weeks ago. They operated on her on Thursday, and it looks really bad. They found huge tumours on both her ovaries, which they removed. And they had to remove her entire bowel. Auntie May said they still couldn't get it all, so I don't know what's going to happen now. Radiation therapy, I guess. At the moment they're doing biopsies on those tumours, and then they'll go onto the next step. She's a little younger than May, she's 77, but I worry that she may not want to fight this. She was even very reluctant to even have the surgery, but I told her that just doing nothing isn't an option either. She was already really sick and couldn't eat anything. I think people sometimes get the idea that if you just stay quiet and do nothing, you won't make the cancer mad at you. But there's no pleasant consequences from being passive either, the cancer will get you and it will be a long, slow, sickening until the end. Anyway, I'm pretty upset about this. My sister is nearby in Vancouver, so she's close enough to go over there; I'm so far away I can't do much of anything except print out stuff from online and send it to them (they never have gotten a computer for themselves). I'm really worried, because now they're BOTH frail, and I don't know if they can continue to live on their own now that they're in such bad health. Roberts didn’t tease the crowd, saying he wouldn’t be discussing any past, present or future cases. “So, my remarks will be brief,” he said, eliciting laughter from the audience. Roberts interjected humor throughout the hour-long event, in which he had a conversation with Rice University President David Leebron on a stage at the campus basketball arena before answering questions submitted on note cards from the audience. Can anyone remember even ONE incident prior to Roberts's sellout to the Left where he was noted as having a quick wit and a reputation as a wag? But starting with his famous Flight to Malta, that's now a constant refrain. “People tend to think we are part of the government like everybody else. We have low approval ratings. But we’re better than Congress or the executive,” Roberts said, prompting laughter from the audience. As John Nolte said, the Left is expert at finding the hidden cravings in weak, vain men like Roberts and then exerting the correct psychological bribe to reel them in. For those of you who might not remember, Kathleen Parker is the "conservative" columnist who in 2008 sold her soul to the mainstream media. Even though our vice presidential nominee, Sarah Palin, had infinitely more political and executive experience than the other side's presidential nominee, Barack Obama, in the heat of the election, Parker still wrote a column stating Palin should step down as the nominee. Suddenly, a columnist few of us knew became an overnight "star." This was the kind of death blow the corrupt media had been waiting for -- a conservative traitor, a National Review writer, no less -- who reaffirmed their narrative and, for her treachery and to ensure the other narcissists among us see how such things pay off, the Devil rewarded Kathleen Parker with instant fame and riches. Across the media landscape, she was heralded as brave and brilliant. Soon she would be handed a Pulitzer and her own primetime CNN program. They're wrong about us. We don't hate you, we don't hate conservatives. No one's asking you to stop being conservative. We would never ask that. All we're asking for is this one thing. And it's only a little thing, a small thing, a baby step. What harm can it do -- this small thing? Who can it hurt? And look at what you get in return. We'll love you. We'll adore. We'll give you affection, acceptance, and stamp your courage into the history books. It's warm here and there are cookies and before you decide, I want you to sit back, close your eyes, and just imagine what it's going to feel like to see your name heralded all across the media, academia and beyond…if you'll just do this one little thing. I discovered an absolutely wizard video series last month: someone on Karagarga mentioned that there had been a Russian version of the Sherlock Holmes mysteries, filmed in the Soviet Union between 1979 and 1986. When I looked it up, I read all sorts of superlatives, especially about the actors who played Holmes and Watson, Vassily Livanov and Vitaly Solomin. I was pretty skeptical - who could possibly be better than Jeremy Brett? - but I figured it wouldn't hurt to check it out. To my astonishment, I found myself in agreement with all those excitable reviewers! 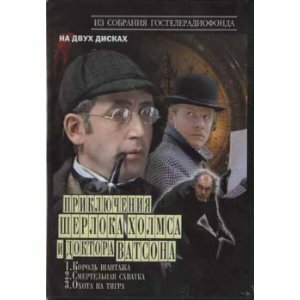 I think Livanov IS the best Holmes. It's an interesting experience, to watch these very familiar English stories and hear all the dialogue in Russian, but it doesn't take long to get used to it. 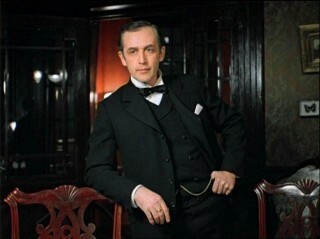 And Livanov is a very engaging Holmes, so you want to keep watching to see what he does next. He's a much warmer Holmes than Brett's - I think part of this is the Russian style. He laughs much more, and even plays silly practical jokes on Watson - though you could argue that that's not entirely out of character, as Holmes sets up Watson for a little surprise in "The Empty House" when he shows him the view of 221B Baker Street from across the street, and Watson sees the life-size bust of Holmes silhouetted in the window. Of course, Holmes is said to laugh silently, whereas the Russians have him burst out into loud laughter, but he was never meant to be an entirely humourless man.. But in this series, he comes across as a quite believable person, someone who'd have no trouble fitting into society, despite his eccentric occupation. By contrast, Brett seems to me like a mentally ill Holmes, who would be an outcast in society if it were not for his special skills. Livanov doesn't stress at all the angst of the character, not even the misanthropy; he seems perfectly comfortable with women, and the sort of man women would feel comfortable with in turn. There's none of that prickly alarm when a woman comes into view; it's just another client, and this Holmes brings out more the chivalry and protectiveness that's there in the original Conan Doyle Holmes, which I think Brett's interpretation rather ignored. I have to admit that all these derogatory descriptions of Jeremy Brett's interpretation only occurred to me AFTER I'd seen Livanov; before that, his seemed to me the authoritative performance. But now... Ah, well, idols are meant to be toppled, I suppose. That said, there are some oddities in this series. I could get used to Livanov's more lighthearted Holmes, but one thing that always stuck out for me was the Russianness of the sets and locations. I believe that Riga was used as the stand-in for London when it came to street scenes, and I could just TELL that it wasn't London. It was too clean, the townhouses look elegantly baroque with bright coloured plaster - it was far too bright and cheerful to be London during the era of Jack the Ripper! Similarly, the country scenes also didn't look like England - you can just tell. It's not green enough, not soft enough, the trees look different somehow; you just KNOW that this isn't really England. And the architecture at times could be downright weird. This was a TV series made for a Russian public, so I figure they were creating what the Russians envisioned as the English style, but the houses look so very un-English. In the end, all these strange styles produced a funny effect; I came to feel that the stories were taking place in a sort of fantasyland England that never existed. An England where everyone speaks Russian. Sort of like in Harry Potter, where you have a wizarding England that bears some resemblance to the real, humdrum England we all have to live in, but suddenly veers off in odd directions when you're not expecting it. There's a lot of this series on YouTube, and I highly recommend that you check it out. But beware, and don't do what I did, which was to start off with 'The Hound of the Baskervilles'. It's the most famous, most familiar story, so I thought it'd be the easiest introduction. Well, it's not. There's a lot of Russian weirdness in this version. For one thing, it adds a lot of humour, and to the English 'Hound' is NOT a funny story at all. It gets points for fidelity to the original by making Sir Henry Baskerville Canadian; on the other hand, it loses points by turning him into some kind of wild yahoo dressed in bearskins and leather chaps! He's like a Russian Yukon Cornelius. I'll grant that the Jeremy Brett version of this story is better - probably the best, in fact. Laura Lyons is quite an unusual character here - she smokes a pipe, which might mean something in Russian characterization, or maybe was just a way of adding colour. The music is quite lovely. The first series is called "Acquaintance", and introduces all the characters in proper order, and strictly according to canon. It's a combination of 'A Study in Scarlet' and 'The Speckled Band'. Actually, ALL the series (except Hound) end up combining 2 or more stories into a continuous story. So Series 2 starts with 'King of Blackmailers' (The Adventure of Charles Augustus Milverton), then links this to 'The Final Problem', which also contains some foreshadowing of 'The Empty House', and finishes off with 'The Empty House'. The 3 separate stories all flow into each other, and sometimes you'll find that the story being told breaks away to start up a new story, only to go back to the original later. I checked YouTube, but the only subtitled section of the series I could find is this segment from 'The Empty House' (called 'Tiger Hunt' here). The subtitles are a bit nutty, but you can understand what's going on. 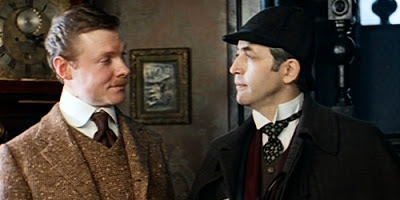 You get to meet the extremely annoying Inspector Lestrade, and you can see that they make Holmes's return a lot funnier than in the Granada series. It's a pity that they provide only this one clip, because this series presents the scariest Moriarty I've ever seen. He really does look threatening and frightening; you can believe that Sherlock Holmes himself would find it necessary to run from this guy. And the idea that poor good-hearted Watson could be marked for death because he's close to Holmes...(shudder) You can see him in the trailer at the top. It's funny how certain images are unmistakeable. If you see a young man holding a skull in his hands and studying it, you know it's Hamlet. And when you see two men struggling on the brink of a waterfall, you KNOW it's Sherlock Holmes and Professor Moriarty! Anyway, it's definitely worth checking out. I and one of the teachers at James's school have started a composting program at the school. Every fall, as I'd drive my bus van to and from the school, I'd look at all the dead leaves on the drive and think what a shame they were being wasted. A highschool is practically like a little village, with all the land and vegetation around it, as well as the cafeteria producing vegetable waste, and even the woodshop to build compost bins. We convinced the principal that this would be a workable project, and several bins have just finished being built, with more to come. Part of the reason for coming up with the project was to provide something for Thomas to do, now that he's graduated from school. So he comes with me twice a week to the school, and I also bring along two other graduates from his class in the autism program, and we go through the school collecting the vegetable and fruit waste in the classes where we've set up plastic bins. It's early days still, we've only been going for about 2 weeks, but I think it's going to work quite well. On Friday, we collected over 7kg! That's about 15 lbs; over a week, that would come to 75 lbs - 300lbs over a month, and over a 10-month school year, 3,000 lbs! And at the moment, people are still not yet in the habit of using the bins; it takes a while before it becomes second nature, so I'm in hopes that by the end of the month we might be getting even more per day. We're weighing the baskets as we collect them, so we can give progress reports on how much we've collected. When the compost is finished, we plan to use it in the greenhouse. This school has a full-size, commercial quality glass greenhouse at the back, which is almost never used. In fact, there aren't going to be any classes in there until next semester, so this has become our base of operations. As it gets colder, we'll be doing less outside - basically just going out to dump our baskets. During those months, we're going to try growing produce in the greenhouse; I've read that lettuce can grow during the winter, because it likes cool weather. We might also try starting plants for spring planting, which we could sell in the spring. I've never actually tried working with autistic people; I've lived with them for decades, but working is a little different. I've quickly discovered that you can't make them just work nonstop until the job is done - they don't operate on that rhythm. They have to have the job broken up into smaller pieces. So we go on our rounds, collect our stuff and deposit it in the compost bin, then head back to the greenhouse. Then we take a break for everyone to rest and entertain themselves with reading or music. Then we wash and dry all the empty bins...and then we take a break again! Then we return the clean baskets to the classroom, return to the greenhouse, and break for lunch. Finally, we potter around in the greenhouse until it's time to clean up and go home. Mostly, I do the work in the greenhouse; I haven't been able to get the boys interested in it, though the girls enjoy it. That may just end up being the division of labour - I think girls are just more interested in growing things. I might have to think of something else for the boys to do - making origami basket liners perhaps. Anyway, this is quite an invigorating project for me, and I really hope it turns out well. It would be nice if this could become like a pilot project for other highschools. The name of our group is "Green Shoots" - I came up with that. Maybe I was being a little sardonic at first, because I remembered Barack Obama talking about "green shoots" of economic recovery...back in 2009! So much for that. I figure we'll demonstrate what green shoots REALLY look like. Years ago, at the beginning of what was perhaps my second autumn here in Ottawa, I remember waking up one morning early in October, to find that there had been a sudden hard frost. It was so unusually cold for the time of year, they mentioned on the radio that the weather had resulted in "frantic squirrel activity", as the unprepared squirrels rushed around to finish their food stockpiles for the winter. The phrase has stuck with me ever since, and I use it whenever the weather seems to lurch toward winter. Yesterday, we actually had some snow. Only tiny little flurries, not even settling on the ground, but still. It's been several years since we've had snow here before November. Last week there was a frost, but my morning glories managed to struggle through with the loss of only the top vines. But last night did it - the morning glories have bit the dust. A lot of trees which were looking charmingly yellow and red last week are suddenly completely bare. I've still got to rake up leaves in the backyard (only one tree has even dropped any yet) but on Thanksgiving last week I finally got around to raking the front. I got out my electric leaf blower/shredder and filled up some leaf bags. Then I started stealthily raking up my neighbours' leaves. They have several trees in their front yard, and they seem to produce the very best dead leaves - brown and dried up like potato chips. I've done this in past years, because I know they just put their leaves out for garbage pickup, so I figured they wouldn't mind if I took them. But this year they came home as I was raking, so I confessed that I've been stealing their leaves, and asked if they'd mind if I took them. They were most magnanimous about it, so today I went after the second fall of leaves and got them all. Unfortunately, mine had been raked into a pile a few days ago, and were still damp underneath; the ones next door were nice and dry. I hope the damp ones eventually dry out; I'd hate them to start rotting, or worse, heat up! I'm so vigilant about leaves because I keep the full bags of leaves stored in our backyard shed all winter, and use them in the summer to mulch the potato plants. They're a perfect natural mulch, keeping the plants moist and suffocating weeds; also, potato plants need to be "hilled" with mulch or dirt to keep any potatoes from getting exposed to the sun and turning green. I need at least 20 bags of leaves to cover the garden, and I'd prefer to have 30. Then I don't have to worry about thin coverage anywhere. In the fall, when I'm putting the garden to bed, I just rototill them under and they rot and enrich the soil. At the moment, I'm up to 13 bags. This summer was so dry, our potatoes ended up being a bit undersized, even though I watered as much as I could. The tomatoes had a nice flavour, but they weren't as numerous as in years with normal rain. One odd thing happened this summer, due to the drought: my beautiful Eglantine rose out front, which usually blooms continuously the whole summer, seemed to go into a coma because of the heat. It didn't die, but it just sat there, doing nothing. When the rain finally came in mid-August, it suddenly began blooming again. It's an English rose, and obviously it needs something similar to the English climate to do well. I'm a married lady with 3 kids, all at different spots on the autism spectrum. In my spare time I translate and create English subtitles for obscure French movies. I also bake, garden and build computers. How Good Is Your Taste? Ay Carumba! I mean... Oh dearie me!